Do I need to hire an attorney for bankruptcy? During a Chapter 7 bankruptcy, non-exempt assets are liquidated in order to pay off certain debts. There are some debts that cannot be discharged, but this allows you to eliminate a number of debts and obtain a start fresh. A Chapter 13 bankruptcy allows you reorganize your debts in order to come up with a more favorable repayment plan. This plan allows you to make more affordable payments and lasts 3 – 5 years. After this time, most remaining debts are eliminated. READ MORE. Will I lose my car or home if I file Chapter 7 bankruptcy? There are certain exemptions that can help you protect your home and car. These exempt items have certain monetary limitations and in order to fully understand if you are able to protect your home or car, you should reach out to our skilled bankruptcy lawyers. READ MORE. While a bankruptcy does affect your credit score and will stay on your report for a number of years, you have the opportunity to begin rebuilding your credit soon after the completion of the process. You can start fresh and work towards maintaining a better credit history. READ MORE. Is debt settlement a good option? For many individuals, debt settlement may be a great option to consider. Debt settlement allows you to negotiate with creditors to come up with a more affordable amount. Many creditors often accept settlements because it means they may still receive a portion of the debt owed to them when, in some cases, they may otherwise receive nothing. READ MORE. One common misconception amongst individuals who hesitate to file bankruptcy is that they won’t be able to borrow money again. It may take some time, but rebuilding your credit will go a long way to helping you with loans, housing, and other financial benefits that require credit checks. READ MORE. If I am married, do I have to file with my spouse? Many of our clients ask this question and the answer is: no. A client is not required to file with their spouse and can file on their own. To prepare the case, we will still need income and expense information from the non-filing spouse. Clients choose not to file with their spouse for many reasons, including to continue to build good credit of the non-filing spouse. READ MORE. How long do I have to wait before I can file bankruptcy again? Can I file a bankruptcy to stop a foreclosure? A bankruptcy can be filed to stop a foreclosure or a sheriff sale for your real property. Depending on your intention with the property (i.e., whether you want to leave the property or keep the property), we can determine the type of bankruptcy that will accomplish your goals. READ MORE. 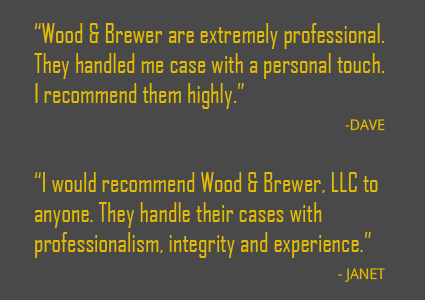 When you work with Wood & Brewer, LLC, you will work directly with your Westerville debt settlement attorney for the most thorough and personalized representation possible. We have more than 15 years of experience with both business and consumer cases. We offer flexible fee payment options for your convenience. Don’t hesitate to contact our firm if you are facing mounting debt. We never take a one size fits all approach, and look forward to the opportunity of helping you find a bright new future filled with financial peace. Speak with our team at Wood & Brewer, LLC if you are considering debt settlement. We are proud to serve the communities of Southern Ohio including Franklin County, Delaware County, and Fairfield County with 24/7 availability. Contact our firm today for debt settlement help or legal assistance for other bankruptcy matters in Columbus. CALL (614) 410-6878 Today!